Lets talk about sleep baby, let’s talk about sleep…. As parents we try our best to assist our children in anyway we can to have good naps and a good night’s sleep. The problem is, there can be soooo many factors that affect a good nights sleep, especially when it comes to our precious children. From my own personal experience of having a child who is what you would call ‘not a great sleeper’, I’ve had to assess every facet of her sleeping environment to try and improve her sleep. Unfortunately, Grace our daughter who is nearly 4.5 years suffers from very sensitive skin, eczema and rhinitis and Noah, who is nearly six months has recently developed eczema too. Grace recently had allergy testing and I was convinced that she had a dust mite allergy as she had all the symptoms, but it came back negative! Although the testing came back negative, I’m still trying to minimise the amount of dust mites that might be lurking in our home for good measure. I was recently gifted Protect-a-bed mattress protectors for our bed, Gracie’s single bed and Noah’s cot. It was a no brainer to try their TENCEL® Signature range as we’ve been using this brand for years already as they’re such good quality. What I love is that they are designed to protect against dust mites present in mattresses. They’re also approved by the National Asthma Council Australia Sensitive Choice Program and the Eczema Association as Sensitive Skin Tried and Tested. As we always try and buy the best mattresses we can afford, I always try and buy the best protectors, especially now we have children. These protectors do an amazing job in shielding them from accidents, spills and bacteria! They’re also fitted with a ‘miracle layer’ that provides the ultimate waterproof, silent and breathable skin. What are your tips for creating a healthy sleep environment in your home? Please note: I was gifted the Protect-a-bed mattress protectors, however all opinions are of my own. Mandy Sacher is the creator of Wholesome Child, she’s a Paediatric Nutritionist and SOS Feeding Consultant and mother of two based in Sydney, Australia. Through her private clinical practice and seminars she has helped thousands of families improve their health and wellbeing. She’s launched her first book ‘The Wholesome Child Nutrition Guide and Recipe Book’ which is available now. I recently caught up with Mandy to find out more about herself and her new fantastic new book. Fun question to start with! What couldn’t you live without in your pantry? The Wholesome Child Gluten Free Mix is my staple!! It is used to prepare all the gluten-free recipes in the Wholesome Child Book. Dinner: Shepherd’s Pie with parsnip and cauliflower mash, steamed vegetables and garden salad. What’s your top 3 tips for parents with fussy eaters? Family meals. Have family meals together and make it a goal to have as many meals together as often as possible. Desensitisation. Encourage your little ones to touch, smell and engage with their food. This starts right from shopping for groceries. Can they help take items off the shelves? Encourage them to pick up a carrot, an apple or a zucchini from the shelf and place it in the basket or trolley themselves – this begins the engagement with the new food. Can they put the dish or new veggie onto the table for the family? Don’t be disappointed if they don’t eat the new food the first time it’s offered – stay positive, freeze what is not eaten and offer it again. Repetition: Make new foods familiar by repeatedly offering them in a calm, familial environment. A child will not go to a stranger the first time they meet them, but after a few visits they generally feel more comfortable to sit with them. The same goes for new foods. Repeated exposure aids the process of engaging with new tastes and flavours. You can also try offering these same foods in different ways – cut into fun shapes, laid out in colour patterns, steamed veggies rather than raw. What’s your opinion on introducing solids earlier to babies to help prevent allergies? I am all for introducing solids earlier and there is plenty of research which shows that it may help to prevent allergies. Allergenic foods can be introduced at 4-6 months of age to all infants, the basis for this new recommendation is that there is no evidence for delaying the introduction of allergenic foods beyond 4-6 months. However, each parent has to follow their instinct and introduce solids when they are ready and when their child is ready. Some babies are not ready at 4 months but are far more interested and equipped with the necessary skills closer to 5.5 or 6 months. I see many mothers feeling pressurised to introduce solids at exactly 4 months and this is counter-productive as babies feed off their mother’s emotions. When it comes to offering a baby their first experience of solid foods it needs to be in a relaxed and calm environment. What’s your children’s favourite meal? Home-made fish nuggets with home-made wedges. You’ve just launched your first book which is very exciting! What drove you to create this book? I wrote Wholesome Child: A Complete Nutrition Guide and Cookbook to provide answers to the many questions parents have around kids’ nutrition, while offering strategies that really work. My philosophy is simple: encourage children to enjoy nutritionally beneficial foods from a young age to ensure optimal development and establish lifelong healthy eating behaviours. The book incorporates lessons I have learned over the past 22 years in the health and wellness industry – plus my own hands-on experiences feeding my two young children. The book provides meaningful answers and proven solutions to the questions and challenges that are raised time and time again in my workshops, in parenting forums and by my clients and friends. 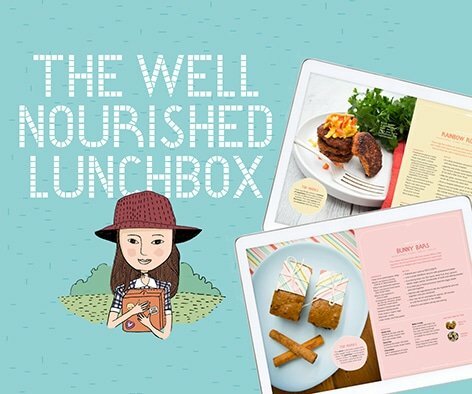 The book also contains over 140 simple and delicious nutrient packed recipes that the whole family can enjoy. My goals for the book is to provide parents with an invaluable companion that will help support their family’s health journey while bringing the fun and enjoyment back to meal times. Mandy has kindly shared with us her delicious Shepherds Pie below. Fill a large pot with water and bring to the boil. Add cauliflower, sweet potato and parsnip and cook vegetables for about 10-15 mins or until they are soft. Drain, rinse and allow to cool for a few minutes. Place all vegetables and coconut oil into a food processor and process until smooth. Add arrowroot powder and salt and process for another minute. Set aside. Meanwhile, heat coconut oil in a large pan and cook onion, leek, garlic, carrot and celery for 3 mins or until they are soft. Transfer into a measurement jar or bowl and blend with a stick blender until smooth. Set aside. In the same pan, cook the mince for 5-10 mins, or until browned. Add vegetable mix, cumin, herbs, salt, tomato paste, tamari sauce and beef stock and let simmer for another 10 mins. Place the mince mixture into a deep baking dish, then top with the cauliflower mash and bake for 20 minutes (it won’t brown on top). Serving and storing leftovers: Serve immediately or store in the fridge for up to 3 days or freeze for up to 3 months. Tip: If your children don’t mind chunky meals, you can leave out the step where you blend the onion, leek, garlic, carrot and celery and simply add them to the browned beef. You can also replace vegetable mash with potato or a combination of potato and cauliflower. Vivian is a Doctor originally from the UK and has recently relocated with her family to the States. Both Vivian’s children have suffered from severe allergies which has lead to the creation of her fantastic Blog ‘Allergy Families‘ which is an amazing resource for families who have allergies and food intolerances. I recently caught up with Vivian to find out more about herself and her blog. I’ve wanted to start a blog for a long time now…. but just never found the time juggling being a GP and mum to two young kids. It is incredible how unaware the general public and medical professionals can be with allergy. They don’t take it seriously and many medical professionals miss the diagnosis because symptoms can be so subtle and there are just no good tests for some allergies. My daughter was hospitalised and tube fed at 8 weeks of age because no doctor (including myself) recognised her symptoms as being caused by milk allergy. People thought she had reflux, then behavioural issues, because she just stopped feeding. She would cry with hunger, drink a little bit of milk then push the bottle away, arch her back and turn her head. She cried all the time and I was desperate and sleep deprived. It wasn’t until I did my own research and found a dietician with expertise in the area that she got the help she needed. Thankfully it is probably more widely recognised now, but if it was so hard for a doctor to help her own children with allergies, I can’t imagine what it is like for non-health professionals. Since I started researching and learning about allergies, I have been able to be an advocate for my patients, friends whose children have blaringly obvious food allergies (to me anyway) but undiagnosed by their own doctors. That’s why I started my blog – I didn’t want my help to be restricted to those who knew me. I knew that if I started a blog my reach could be much wider, and I would be able to help more people. I wanted to share my journey, tips and useful medical information I learnt along the way. There are many things which I found out that are helpful for kids with allergies which my allergists never told me. Things like probiotics – which a lot of allergists still insist has no good evidence but I believe gut health is key to children outgrowing allergies. Do you think being a Doctor made the process to get a diagnoses and treatment plan easier? Yes and No. To this day I still have massive mother guilt for missing the diagnosis in my own daughter. But I had access to a network of top healthcare professionals and I’m sure my daughter’s diagnosis would be even more delayed had it not for my own contacts. Treatment plan is another matter – I was in desperate search for things that would help my daughter outgrow her allergies. Maybe I was in denial, maybe I just did not want to spend the rest of my life constantly worrying about accidental ingestion and walking on eggshells. This was where I felt like I was up against a brick wall. No one gave me any answers. Everyone told me to just avoid the food and hope they outgrew their allergies. But I did not want to do that. So I did my own research and reading, attended all the allergy lectures to gain a better understanding. In a way, being a doctor has helped because I knew where to look for reliable information, and I had access to all the allergy training events. What advice would you give parents who suspect their child has a food allergy or intolerance? Trust your gut instincts – you really do know your child best. Read my blog post on subtle symptoms of allergy (http://allergyfamilies.com/food-allergies/how-to-know-my-child-has-a-food-allergy/) – it is not all lip swelling/rash/wheezing. The symptoms can be so subtle: constipation, abdominal pains, aversive feeding, diarrhoea. If you suspect your child might have an allergy – don’t stop looking for a doctor who takes you seriously! Western tests are good at picking up IgE mediated allergies (but these are really easy to spot anyway, you don’t need a test when someone’s lips swell up after eating something). But it is the non IgE allergies which are being missed all the time and it is a shame that children and their parents are suffering unnecessarily because doctors are not trained to spot these. Just because a skin prick test or blood test is negative, does not mean your child is not allergic to a food. Elimination is actually the gold standard but this should not be done without consulting a healthcare professional first. How are your children now? My daughter is 8 and she was allergic to milk, egg and peanut. She has outgrown all these now. My son is 6, and was allergic to milk, egg, wheat, kiwi, peanut, walnut, pecan, cod, lemons and now ‘just’ allergic to milk, peanut, walnut, pecans. He is currently on the milk ladder where I am introducing boiled milk at small increments to see if he can tolerate it, and he appears to be starting to grow out of his milk allergy too (touch wood)! Broadening my mind and horizon to what I didn’t know. Before my kids, I was a pretty narrow minded doctor who would laugh at anything holistic or complementary (e.g. homeopathy) because the scientific evidence for these are weak. However, mainstream medicine failed me when I needed it. I was not able to help my daughter and it was so frustrating for me as a doctor. The more I read, the more I realised that the gut is central to a lot of diseases. And actually, focusing on ‘allergy’ without assessing gut health is treating surface symptoms without the root cause, I became more open minded through my own research and reading; I realised that, actually, integrative medicine is the best way to practise medicine. Now I use nutrition and natural remedies in combination with mainstream medicine. What are you favourite gut boosting foods? Bone broth – there is a reason why this gem is found in culinary traditions around the world – it contains amino acids and collagen which is healing for the gut. Fibre – a high fibre diet supports the growth of beneficial bacteria in your gut, and if probiotic supplement is not supported by a high fibre intake, the expensive bacteria wouldn’t survive in your gut anyway. Children do need calories to grow, however, so be careful to balance this as most high fibre foods are not calorific. In an oven or over a grill, char the onion, bulb of garlic and ginger - I normally put it on a top rack in the oven and put on full heat grill. The onion and garlic will char first - remove these, and let the ginger char slightly. Let it cool down, and remove the completely burnt bits. In a pan, roast the cloves, star anise, cinnamon, black peppercorns - low heat, this brings out their flavor. When cooled, place into a spice bag (you can get these in asian supermarkets, or make them yourself from muslin/cheese cloth. If you don't mind the odd bit of peppercorn in your soup, you can also just drop these loose into the pan. Parboil the bones - in a pan, put the bones in and cover with just enough water, and bring to boil with lid on. Let it boil for 2-3 minutes. Drain and wash all the impurities that have come out in the boil with water. Put parboiled, cleaned bones back in the pan, put in 18 cups of water. add the spice bag (or just drop the spices in loose). Bring back to boil. Then switch to low heat and leave on stove for at least 8 but up to 24 hours ( I normally do 10, by that time you really start to see the broth turning cloudy which indicates all the amino acids, collagen being boiled into the soup).